Blue Cliff Zen Center is a 501(c)(3) non-profit organization registered with the state of Oregon. We offer a weekly Zen meditation group, yoga, mindfulness courses, and teacher trainings. 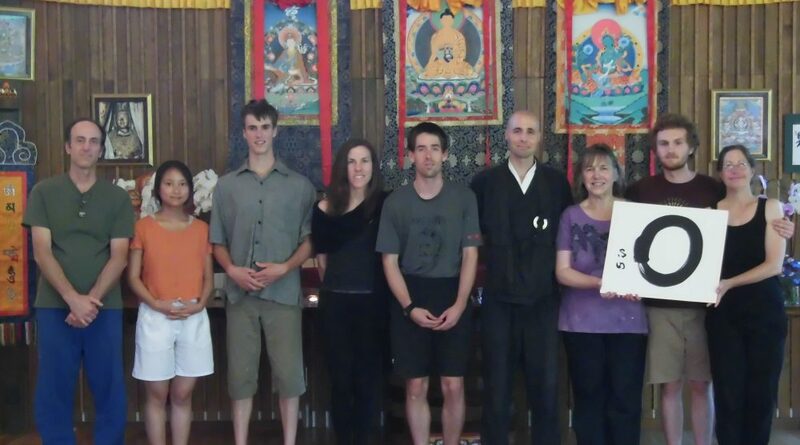 We also do intensive Zen retreats, community service projects, and Zen ceremonies. Our lineage is the Zenways branch (Zendo Kyodan) of the Japanese Rinzai Zen tradition of Shinzan Miyamae Roshi. London Zenways, led by Daizan Roshi, is a sister group of ours and has been instrumental in us growing our roots. The above photo was taken at Saraha Nyingma Buddhist Institute in Eugene. Our mission is to reduce the amount of stress, anxiety, and fear experienced in the community by offering Zen-related (meditation and mindfulness) activities, while at the same time fostering well-being, compassion, and insight. We are committed to helping develop a more awakened community and world. Please consider sponsoring a meditation session to help us continue offering these important programs. Matt Shinkai Kane, M.A., is the lead teacher at Blue Cliff Zen Center. He studied Zen in Japan for over seven years and currently lives in an east-Eugene apartment rather than within a celibate monastic setting. Please visit this link for other resources about our lineage. For a biography about Shinkai please visit this page.